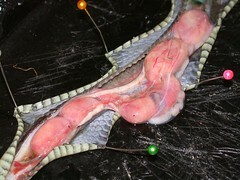 Instead, Jen discovered at least half a dozen masses that could only be infertile egg masses, trapped in the snake’s oviduct. This was perplexing. For one thing, this nearly-six-year-old snake hadn’t been so much as in the same cage as a male since shortly after her birth, so these weren’t fertile masses. Bisecting an egg mass proved as much. Second, they were much larger than I expected: Big Momma, my female red-sided garter snake (she died in late 2002), passed infertile egg masses in late 2000; they were much softer and much smaller than these masses, and Big Momma was at least three times as large as this snake. And third, they were quite firm, as hard as a jelly candy. Kim suggests that this is occasionally symptomatic of older female snakes: a last-ditch effort at reproduction, perhaps. Consider, for example, that Big Momma’s last litter (in 2002) numbered 42 live babies; her previous year’s effort was only 26. In any event, it’s not something I could have expected. Female snakes that are not exposed to males and that are not hibernated do not necessarily generate infertile egg masses; it’s only happened twice to snakes in my care. In addition to Big Momma’s slugs mentioned above, Spot, a speckled kingsnake now in Florence’s care, was eggbound in the summer of 2001, mostly because we didn’t think she was a girl (oops). In both cases, each snake had been hibernated the winter before. Truth be told, despite being told that I’m not to blame, I’m bothered by this loss. I’ve had this snake (and her sister, who’s still going strong) longer than any other snake I’ve lost — since October 2000. As far as I know, I’m one of only two people in Canada who keeps this species in captivity. It’s listed by COSEWIC as a threatened species; I had the requisite paperwork when I was living in Ontario. Even if there really was nothing I could have done, and even if her lifespan was three times as long as any other Butler’s garter snake in captivity, I still feel responsible.